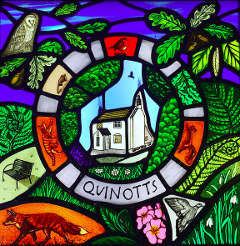 If you need advice on a new project or with a restoration of stained glass, leaded panels or fused glass anywhere in the UK or Europe feel free to call me. We offer courses in stained glass, fused glass and copper foiling. 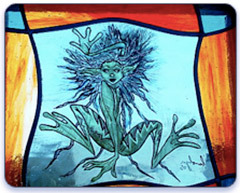 Stained Glass windows (Commissions and Repairs), Stained Glass art. or a fabulous specially designed Front Door? Carolyn McDonald, Professional Stained Glass Designer can help you with that dream. She is now based in Corriegills, Isle of Arran, Scotland. Kaleidoscope Studio working principally in SG. Stunning images from precision optics and exotic glasses. Traditional and contemporary stained glass window panels and leaded lights. Specialists in restoration and repair. Cheam leaded lights is a professionally run company with over 30 years experience in the field of leaded light windows, stained glass, restoration, design, and fitting. Surrey Stained Glass have installed fine windows into builds from single Window designs to major building projects, including new builds. Stained glass panels using traditional techniques and materials. Fun, bright personal copper foiled stained glass, gifts and commissions. Lamps, mirrors, picture frames. Specialists in traditional Leaded Light glass, we concentrate solely on Traditional Leaded Lights and refurbishing steel windows. We mainly make domestic and ecclesiastical stained glass windows. We also have a variety of "suncatchers" and jewellery in our shop. We supply our customers with beautiful, hand-crafted, leaded stained glass windows and doors that make the perfect addition to any decor. The Jonathan Leckie Associates website shows examples of recent restorations and commissions, in figurative and abstract styles in churches plus many domestic commissions. 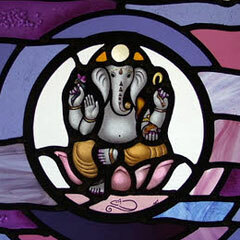 Becky Harris Cowley is a freelance stained glass and sandblasting artist and designer. A super fast loading site with plenty of excellent examples on show. Orchid Stained Glass concentrates on collections of light shades, but also designs and makes domestic windows using traditional lead and mirrors in copper foil.